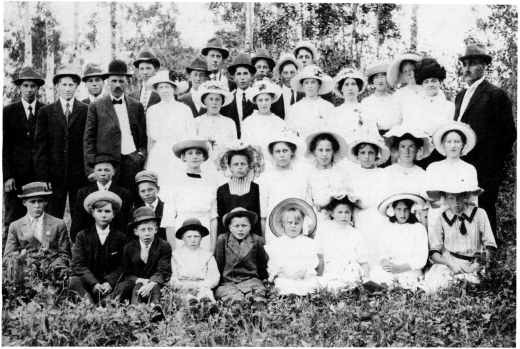 Hilltop Baptist Church Sunday School and Young Peoples July, 1913. Left to Right: Hjalmer, HindorfJ, Robert Johnson, Albert Skoglund, Einar Sundmark, Edwin Peterson, Elsie Peterson (Mrs. Hibner), Lilly Sundmark, (Mrs. Koping), Hilma Armstrong (Mrs. Jacobson), Emmy Skoglund (Mrs. Larson). Second Row: Albin Sundmark, Harry Sundmark, Bertha Larson (Mrs. Tidholm), Ida Peterson (Mrs. Miller), Esther Peterson (Mrs. Vickberg), Ester Skoglund (Mrs. Peterson), Ingrid Armstrong (Mrs. Holmberg), Martha Larson (Mrs. Lundman), Clara Larson (Mrs. Larson). Third Row: Alfred Skoglund, Emil Larson, John Sundmark, Hannah Larson (Mrs. Norden), Jennie Ostrom (Mrs. Wickstrom), Helga Sundmark (Mrs. Larson), Hilma Vllberg (Mrs. Larson), Olga Johnson (Mrs. Fredrickson), Ingeborg Hindorjj (Mrs. Erickson), Clara Larson (Mrs. Vllberg), Mrs. and Pastor Hindorjf. Back Row: August Larson, Knut Skoglund, Hans Skoglund, John Skoglund, Nils Larson, Ernest Ullberg, Arvid Vllberg and Elgie Walstrom. Ladies oj the Hilltop Baptist Church. Back Row, Lejt to Right: Hanna Larson, Hilma Ullberg, Bertha and Clara Larson, Ida Peterson. Front Row: Anna Booth, Ingeborg Hindorj, Esther Peterson. In May of that year Pastor Meyer united in marriage, Vernus Nordin, granddaughter of charter members Mr. and Mrs. Peter Larson, and Herb Gregor. When the present church was built in 1927, a Ladies Aid was organized. Now known as The Mission Circle, it has continued to meet monthly in homes and has assisted in numerous ways to support and extend the work of the church. In 1907 collections and donations amounted to $140.00. It was not until 1947 that church income ex­ ceeded $1,000.00. By 1951 it had doubled to $2,000.00 and has now reached $18,000.00. The envelope system for the giving of tithes and offerings was adopted in 1947. In 1965, a new parsonage was built, and completely paid for in three years.